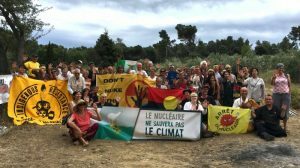 Narbonne, France–During this week of the 73rd anniversaries of the nuclear attacks on Hiroshima and Nagasaki, the International Anti-Nuclear Summer Camp takes place near Narbonne in the south of France from August 6th to 12th. Tents, performances, and debates are waking up a peaceful estate of olive trees and wild thyme. Located a few miles away from Malvési, the Orano uranium-conversion facility (formerly Areva), this meeting of 17 nationalities focuses on all aspects of the nuclear fuel chain. How can the nuclear industry propagate so much new waste when there is waste that has not been properly cleaned up at uranium mines, nuclear weapons facilities, and nuclear power plants? Why does government allow the nuclear industry to continue, knowing the health and environmental dangers, as well as possible terrorism risks? How do private interests suppress democracy and human rights? What are the solutions to fight against nuclear proliferation? How can we separate nuclear energy into “civilian” and “military” uses? To address these shared problems, the International Anti-Nuclear Summer Camp has designed a week’s long program filled with workshops, discussions, film screenings, debates, activist formations, site visits, music, street actions, and two commemorations for the bombings of Hiroshima (August 6) and Nagasaki (August 9). From: Belgium, Canada, France, Germany, India, Ireland, Japan, Navajo Nation (Indigenous Nation of Turtle Island), Netherlands, Norway, Peru, Portugal, Russia, Spain, Turkey, United States, and Vietnam, this year, several guests, including nuclear workers, activists, community organizers, and members of civil society are speaking to share experiences and information about nuclear activities in their respective countries. All share a common diagnostic: from uranium mines to radioactive waste, the entire nuclear chain is extremely dangerous, too polluting, too expensive, too anti-democratic, and cannot be a solution to climate change. This international dialogue depicts an unforgiving reality of the violence created by the nuclear industry and lobbies all around the world. Simultaneously, this international meeting gives a wonderful optimistic outlook: everywhere, resistance is rising. All around the world, courageous people are struggling against a deadly industry and promoting ecological energy transition. This week’s explosive news from the “more bang for the buck” folks is that up to three barrels of unspecified “radioactive material” either ruptured or burst or exploded at the Idaho National Laboratory (INL), near Idaho Falls, on April 11. “An exothermal event” is how Energy Department (DOE) spokesperson Danielle Miller described the prompt deconstruction of the rad waste drum(s). “Exothermal” is a nice distraction that means “a chemical reaction accompanied by the release of heat.” The usage reminds me of the May 1996 “gaseous ignition event” involving hydrogen gas in a fully loaded high-level rad waste cask at Wisconsin’s Point Beach reactor site. The cask contained 14 tons of highly radioactive used reactor fuel, and the eruption of Public Relations inventiveness popped the container’s 4,000-pound lid right off. One theory about the cause, according to the AP, is that “radioactive decay made the barrel[s] heat up and ignite particles of uranium.” Unfortunately for those who put out the smoldering barrels, “When the firefighters left the building emergency workers detected a small amount of radioactive material on their skin,” the AP reported April 12. The very next sentence in this story was that the DOE’s Miller said, “None of the radioactive material was detected outside of the building where the rupture occurred” — except for the contaminated firefighters who somehow don’t count. Because of decades of “secretive record-keeping” it is hard to find out exactly what is in the burst barrels and got on the firefighters. INL officials do not “know the exact contents,” Joint Information Center spokesman Don Miley reportedly said. The ruptured Idaho Lab barrels reportedly contain a mixture of fluids and solvents sent from the long-shuttered Rocky Flats plutonium weapons production site near Denver, the AP reported April 13. The name Rocky Flats should have rung a bell for INL’s “they haven’t run into this” Don Miley. Plutonium bomb fabrication at Rocky Flats caused the second largest industrial fire in US history, Sept. 11, 1957. The blaze howled for over 13 hours, consuming two tons of plutonium and destroying all 620 industrial filters designed to trap particles. Between 30 and 44 pounds of respirable plutonium-239 and plutonium-240 escaped through chimneystacks, drifting downwind to Denver. When smokestack monitors were reconnected, radioactive measurements were 16,000 times greater than “allowable” standards. No emergency response was taken to protect the people of Denver. Exploding rad waste has been around a long time and has a sordid history. 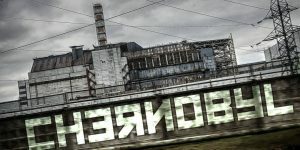 In September 1957 at Kyshtym in Russia, a tank holding 70 million metric tons of highly radioactive waste exploded and produced a massive plume that contaminated 250,000 people across 410 square miles. This risk always comes with high-level rad waste. It helped cancel the plan to use Yucca Mountain, Nevada for abandonment of commercial nuclear power waste, because physicists at the Los Alamos National Laboratory reported in 1995 that the material could erupt in a catastrophic explosion. In December 1993, DOE assistant secretary Thomas Grumbly told the New York Times that high-level rad waste in tanks at the Savannah River Site in South Carolina, the Hanford Site in Washington State, and at Idaho Lab could also “fly apart” if it fuel fell to the bottom of storage pools and caused a “critical mass” to accumulate. At Hanford, hydrogen gas that builds up inside large tanks of high-level liquid rad waste could “possibly cause an explosion that would release radioactive material,” the AP reported in June 2013. In 1990, Ronald Gerton, then a director of waste management there said, “A spark could really set it off,” referring to 22 tanks that generate enough hydrogen gas to cause and explosion “powerful enough to blow them open,” the Milwaukee Journal reported. The Environmental Policy Institute had warned of this risk in September 1987, reporting that the probability of such an explosion may be as high as one-in-50. Back at the Idaho Lab, spokesman Don Miley said, “They haven’t run into anything like this actually happening” but he has a short memory. It happened four years ago, on Valentine’s Day 2014, at the DOE’s Waste Isolation Pilot Plant in Carlsbad, New Mexico. A barrel of plutonium waste exploded underground, contaminating the entire facility, including the elevator and ventilator shafts, and internally poisoned 22 workers who inhaled the plutonium-laced dust. More recently, on October 18, 2015, a fire and explosions spurred by rainfall hurled 11 buried barrels of radioactive chemical waste from a trench into the air and spewed debris like a geyser 60 feet high, at a “US Ecology” site near Beatty, Nevada. This shocking fire in one of 22 shallow trenches of radioactive waste couldn’t be put out with water hoses because water started it in the first place. Authorities had to close US Highway 95, cancel school, and await more explosions while they let the fire burned itself out. US Ecology had its records seized by Nevada’s Radiation Control Program, which has never disclosed what sorts of radioactive materials were burned in exploded Trench 14 — although dump site is known to hold a total of 47 pounds of plutonium and uranium isotopes. In the Idaho Lab accident, the first responders “got some radioactive contamination on their skin, but emergency workers washed it away,” the DOE’s Danielle Miller told reporters. And, she added, “The firefighters did not inhale any of the radioactive material.” Miller can’t possibly know this, but it could be true, someday, when our noses and mouths aren’t attached to our skin.